Last night Apple announced a rare cut to its sales forecast due to slowing iPhone sales in China. The World’s second largest economy, China has released numbers showing that parts of its economy are slowing and that is putting pressure on markets globally. With respect to Apple specifically, today is sure to be a volatile session as the stock is trading off over 7% in premarket, adding to the 16% it is fallen in the past 6 months. I’ve been asked where I think you can start to buy the stock, so let’s go over some scenarios where it makes technical sense to begin acquiring shares with the long term in mind. If we begin with the latest major rally in Apple starting in 2016 and topping in Q4 of 2018, we are nearing an important Fibonacci retracement level and may test this today. 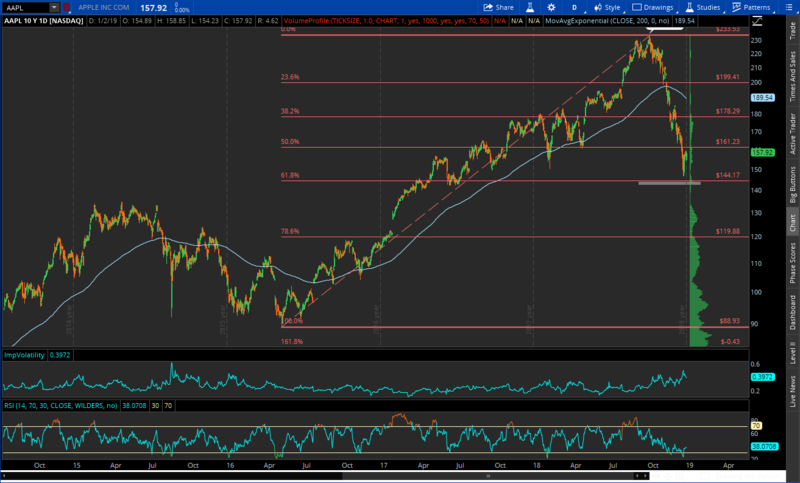 I would be comfortable putting the first of my position on near the levels at the 61.8% Fib retracement of the 2016-2018 rally. Zooming out to a weekly chart to calm some of the noise you can see the next major level that would serve as a buy zone. 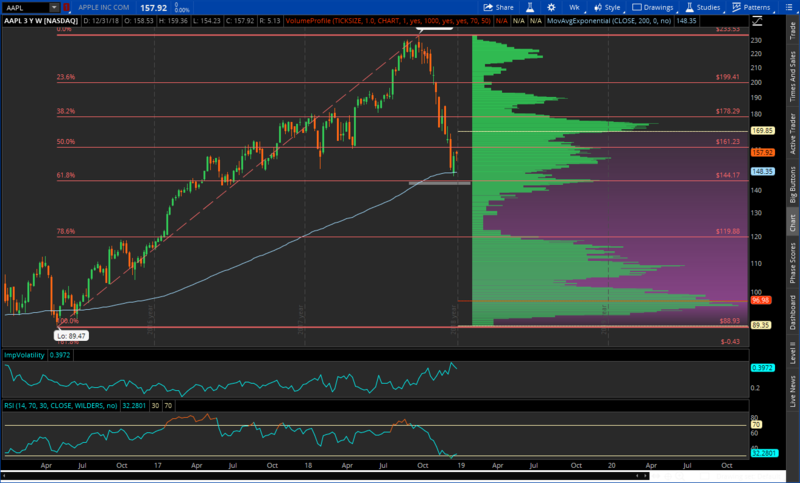 The 78.6% Fib retracement of the same 2016-2018 rally coincides with an area where volume becomes more pronounced. That would be where I would add the remainder of my position as I don’t think it falls further than that. 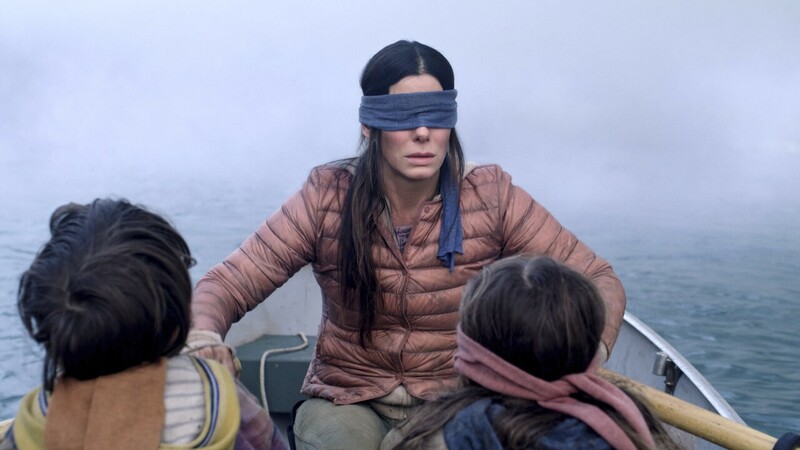 Of course I could be wrong as the market doesn’t care what I think. Nor does it care what you want. So what do we know? We know the above technical levels will serve as at minimum short term support, the $120 level likely long term support unless the World really goes to hell in a handbasket. We know that Apple has a cash rich balance sheet, pays a 1.3% dividend has almost 58 billion in free cash flow. With a current Price/Book of 9.19 and Price/Sales of 3.71 this get cheaper from a fundamental perspective on the way down. I have been raising cash since October and this has been a stock on my shopping list. I will begin to pickup some shares today, fully aware that I may take heat. That is perfectly fine as this is not a trade, it’s a long term buy.